From a Tribute To a Tiger Program in Honor of Flying Tiger & Naval Aviator: John E. Petach Jr. These stirring words are more fitting in describing the life and exploits of John E. Petach, Jr. who came from Perth Amboy, New Jersey fought courageously, and lost his life in the skies over China. For those who knew Johnnie Petach, and even those who simply lived through those times, this is an occasion of recollection. Those were days of peril and anxiety for the whole world. In retrospect there seemed to be have been fewer doubts about what was right and wrong than in our own time. At least there were men who responded quickly and without any mental reservations. John E. Petach, Jr. was born July 15, 1918, during the closing months of another great war. John received his primary and secondary education in Perth Amboy. He graduated from his High School as an Honor Student in 1935. As a youngster he displayed a time for music an accomplished singer. John sang for his own Roman Catholic Parish and found time to help out as a Cantor. He demonstrated an early belief in the higher principles of democracy and political freedom. A reputation for personal integrity and ethical behavior was John’s. In 1939 he received a degree in chemical engineering from New York University where he was president of his chapter of the Psi-Upsilon Fraternity. It came as no surprise when, upon graduation, he announced to his parents that he wanted to fly and had applied to U.S. Navy for admittance to the aviation program. John was accepted and received his flight training at the famous Pensacola Naval Pilot School. He flew the various Yellow Perils then being used Stearmans and Naval aircraft assigned to a Scout Bomber Squadron, VS42 aboard the USS Ranger, the first American carrier designed as such. She was then including a complement have two scout bomber squadrons the VS41 and 42, equipped with the Vought SBU-1 biplanes which were later phased out by the Navy by 1941. John and his comrades were flying Vought’s next product the SBU-2, a monoplane dive-bomber, some which saw limited action in World War II. In 1937 the series of incidents between Japan and China, related in open war. A full-fledged invasion had resulted in the loss to China the eastern coastal areas in the great cities of Metropolitan China. Although Japan could not occupy all the country, the Imperial forces were inflicting heavy losses On Chiangs armies and ragtag Air Force. Japanese bombers routinely blasted Chungking and other key points with little effective opposition. Claire Chennault who had retired from the US Army Air Corps had become Chaing Kai Schek’s Chief Air Adviser. Accordingly, early in 1941 he canvassed the American aviation services for volunteers to fly for China, as a fulfillment of Chaing Kai-Shek’s request of America that planes and pilots be sent over to thwart the Japanese juggernaut Smashing through China, to protect the Burma Road the lifeline of China. Officially known as the American Volunteer Group or AVG, strict confirmation records credit the Flying Tigers with destroying 296 planes and 1500 Japanese. Actually it isn’t doubted that 600 planes were shot down. The AVG lost nine men in battle. The fighter planes of the Flying Tigers were actually inferior dog fighters against the maneuverable Japanese planes, but Chennault developed tactics to take advantage of the P 40s heaviness and greater diving speed: get above the enemy hit them on the first pass then dive and gain height for a second pass. Johnnie Petach was a high-ranking ace in the group. He shot down three enemy bombers on January 23, 1942. 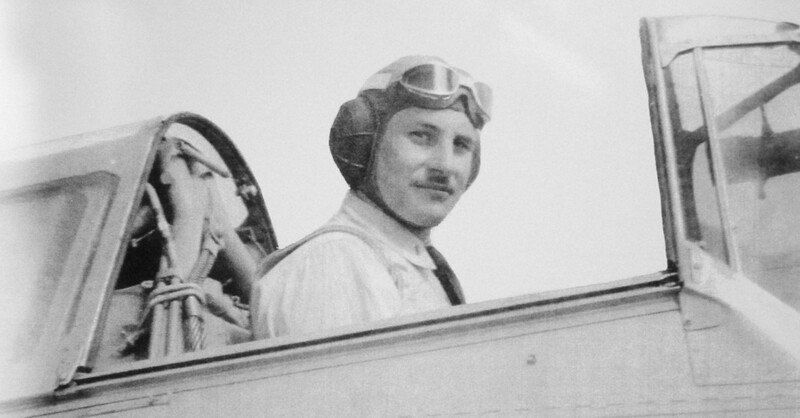 John continued to fly through the hectic campaigns of the first half of 194. He and his fellow Tigers provided most of the few bright spots of that period. In April and June 1942 about 50 improved P40-E fighters came direct from the US. John flew one of these. #106. The US government later decided to assign a regular Air Force unit to China. On July 4, 1942, the AVG passed out of existence, when the Army Air Force took over the job with its 23rd fighter group, commanded by Col. Robert L. Scott. Almost all of the original flying Tigers returned home for a well earned rest, but some were needed to stay behind a little longer to help train the newly formed 23rd. Petach was all set and packed to leave when he was asked to stay. He was going to return home with the girl he recently married, one of the two AVG nurses, Emma Jane “Red” Foster Petach. He stayed to offer his services. July 10 was to be his last mission. It turned out the mission was an offensive one, and Petach could have refused it, as he remained with the group for the purpose of air dome defense, but he volunteered. He went in on a dive bombing run, let loose his havoc on the Japanese gunboat, then suddenly was in trouble-his ship went down and he was killed. The pilot who flew on his wing said Petach’s bomb hit the target but at the same instant his plane exploded, apparently hit by ground fire. His wife, Emma Jane Foster, returned home in August. Their daughter was born in February, 1943. We not only honor John, but pay tribute to his loved ones as well, who are such an integral part of his dedicated life. This entry was tagged American Volunteer Group, AVG, Clair Chennault, Emma Jane "Red" Foster, Flying Tigers, Johnnie Petach. Bookmark the permalink. My wife was fortunate to visit Johnnie’s mother Julia and sister Mary Petach on a regular basis. Joe Fusco (wife Agnes now deceased). They truly were good people. they took us in like family. Do you know from where Petach family came to USA? Maybe from Slovenia around year 1900? Thank you for your answer. Best regards, Ales From Slovenia EU.